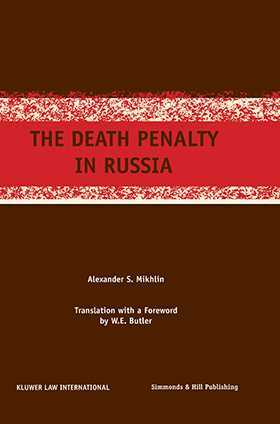 In the twentieth century few societies have vacillated between extremes on the death penalty as has Russia. Taking the century as a whole, few countries have used capital punishment so massively, whether judicially or extrajudicially. Dr. Mikhlin's study is an invaluable contribution to this debate. He offers statistics, official and unofficial, on the death penalty which inform the discussion, but more importantly, he addresses issues which have been largely ignored, even in the specialist literature. These include an examination of the purposes of chastisement in the form of capital punishment and the internal procedures followed with respect to pardons, as well as the regimes under which prisoners are confined and the theories of punishment responsible for the configuration of these regimes. He explores the legal status of persons sentenced to death and, on a comparative basis, the means by which the sentence is carried out. The work is intended for scholars, students, postgraduates, and those who work in agencies which execute punishments, the courts and the Ministry of Justice, as well as for the general reader with an interest in the issue of the death penalty.